1. 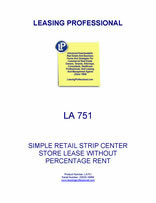 The Landlord hereby leases to Tenant and Tenant takes from Landlord the following described Premises situated in ____________ County, State of ____________, Store Space No.______, as outlined on Exhibit A, attached hereto, containing approximately _______ square feet, in a retail center located upon a tract of land described as ______________________________. 2.1 The term of this Lease shall be for _________ (__) years, commencing on _________, 20__ and terminating on _________ , 20__. 2.2 Option to Extend. Tenant, provided it is not in default, has the right to extend the initial term of this Lease for two extension periods, each extension for a period of three years. To exercise its option to extend, Tenant must notify Landlord in writing 180 days prior to the end of the lease term then in effect. If Tenant fails to so notify, Landlord may lease the existing premises to another party. 2.3 Rent on Options. If a Buyer exercises its right to extend the initial term of this Lease, monthly rental for the first three-year extension period shall be $____________ per month due on the first day of each month. If Buyer exercises the second three-year extension period, monthly rental shall be $_________ per month due on the first day of each month. 3. Tenant agrees to pay at such place as may be designated by Landlord, minimum rent for the premises of $______ for the month of _______ 20__, plus Tenant's pro-rata share of Real Estate Taxes, Property Insurance and C.A.M., and $_____ per month from ________, 20__ through ______, 20__, plus Tenant's pro-rata share of Real Estate Taxes, Property Insurance and C.A.M. If Tenant exercises any option to extend the term hereof, then the C.A.M., Taxes and Insurance shall be adjusted to fair market amounts prevailing at the time of such extension. 3.1 It is agreed that Tenant, concurrently with the execution of this Lease, has deposited with the Landlord, and will keep on deposit at all times during the term of this Lease, the sum of ___________ U.S. Dollars ($____), the receipt of which is hereby acknowledged, as security for the payment by Tenant of the rent herein agreed to be paid, and for the faithful performance of all the terms, conditions and covenants of this Lease. If, at any time during the term of this Lease, Tenant shall be in default in the performance of any provision of this Lease, Landlord shall have the right to use said deposit, or as much thereof as necessary, in payment of any rental in default as aforesaid and in reimbursement of any expense incurred by Landlord by reason of Tenant's default, or at the option of Landlord, the same may be retained by Landlord. In such event, Tenant shall, on written demand of Landlord, forthwith remit to Landlord a sufficient amount in cash to restore said deposit to its original amount. In the event said deposit has not been utilized as foresaid, said deposit, or as much hereof as has not been utilized for said purposes, shall be refunded to Tenant, without interest, upon full performance of this Lease by Tenant. Landlord shall have the right to co-mingle said deposit with other funds of Landlord. Landlord may deliver the funds deposited herein by Tenant to the purchaser of Landlord's interest in the Leased Premises in the event such interest be sold and, thereupon Landlord shall be discharged from further liability with respect to such deposit. Said deposit shall not be considered as liquidated damages and if claims of Landlord exceed said deposit, Tenant shall remain liable for the balance of such claims. 4. Tenant agrees that the premises will be used and occupied solely for retail sales and storage of _______ and other similar items.